For those who want to continue living at home but need help with day-to-day tasks, All Metro offers different levels of personal assistance that are affordable, preserve dignity, and maintain a high quality of life. We built our team structure to ensure that clients receive the best attention. Each one of our fully staffed local branches offer personalized service, familiarity with community resources, customized care plans, immediate resolution of any concerns, and effective recruitment of qualified staff. 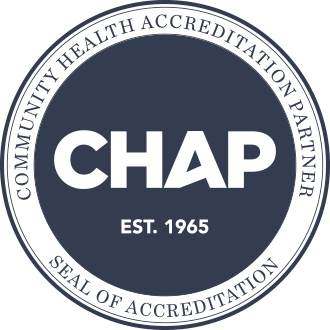 In addition to being licensed by the states in which we operate, we are also proud to be accredited by the Community Health Accreditation Partner (CHAP). A CHAP accredited organization is held to even higher standards than the states require. All Metro has contracts with nearly every type of insurance plan. We also participate in a variety of specialty health insurance programs tailored to traumatic brain injury, nursing home transition and diversion, developmental disability, and school-based care. Our enrollment specialists will work closely with you to explore service options that may have low or no cost to you or your loved ones. Most of the time, all you need to do is make a single call and we can take it from there. And, once care begins, we’re available to answer any questions you may have – 24/7. All Metro is a division of Simplura Health Group, one of the largest home care companies in the country. This affiliation allows access to financial resources and industry expertise necessary to pursue better quality of care on a continual basis. With All Metro, you get the best of both worlds: the personal, community-based service of a local agency, and the confidence, reliability, and resources of a large enterprise. We have been providing home care services since 1955. Originally, we focused on domestic and companion services, but this scope of service later broadened to accommodate the growing needs of the aging population and those with chronic conditions. Our team members include homemakers, home health aides, personal care aides, skilled nurses, therapists, and others. All team members are carefully screened and specially trained to ensure they meet our high standards for professionalism and care delivery. They are also supervised by a Registered Nurse who visits each client’s home on a regular basis to assess the client’s continued well-being and confirm that all needs are being met.